Placing culture at the heart of development policy constitutes an essential investment in the world’s future and a pre-condition to successful globalization processes that take into account the principles of cultural diversity. (UNESCO, 2016)  Culture which refers to values, beliefs, languages, knowledge and wisdom has become recognized as a powerful source of sustainable development. It is an essential means to an intellectual development based on the understanding of traditions, customs, lifestyles and the landscape of one’s living. As such, considerations for culture in sustainable development are indispensable for respecting and satisfying people before and after policy development and implementation processes. Culture and tourism can complementarily interact with each other as tourist destinations inevitably involve the interface of rich and diverse cultures, civilizations as well as our daily lives. The culture surrounding our everyday life reduces barriers to entry into the tourism sector for local groups and also provides easier access to the understanding of cultural differences for tourists. To this end, managing public spaces and cultural landscapes, which are the great resources of tourism and the ground of our living, should be designed and managed with careful consideration of culture. Cultural tourism is also a cost-effective measure of economic development with its less invested infrastructure compared to other industries. In 2004, UNCTAD read this trend stating if the 49 Least Developed Countries (LDCs) are taken together, tourism is the single most important source of foreign exchange earnings . Many countries experienced failure in achieving the magic of trickle-down effect which possibly promised the benefits of local people through mass community transformation. In retrospect of the negative consequences including heritage degradation, therefore, there has been widespread awareness on well-managed in/tangible heritages, nature and public spaces. That is to say, cultural tourism development with quality through the community’s participation has gained more importance for the projects’ longevity for sustainable development. In this sense, the workshop will offer lectures and group activities for participants to understand the complex relation between culture and tourism. Also, some best practices of cultural tourism will be presented through the case studies in Asia and Europe. There will be sessions to discuss some policies and cultural project sites in practice in line with SDGs that could provide some inspirations. Finally, the workshop will help local actors effectively develop relevant policies to conserve and promote their cultural advantages and enhance diversification for the social, environmental and economic benefits for the peoples involved.
? Provide an opportunity for local governments and cities in the Asia-Pacific region to exchange cultural tourism policies and best practices throughout city-to-city cooperation.
? Promote a learning atmosphere between cities and establish a strong network that they can utilize after the workshop.
? Offer a venue for knowledge transfer and discussion and inspire participants’ motivation to implement sustainable tourism policies in relation to culture.
? High-level authorities and experts from central and local/city governments.
? Representatives from NGOs, regional and community-based organizations, academic and training institutions and other local actors within the Asia-Pacific region. ** Participants are expected to work in the related field for at least one year after the workshop.
? 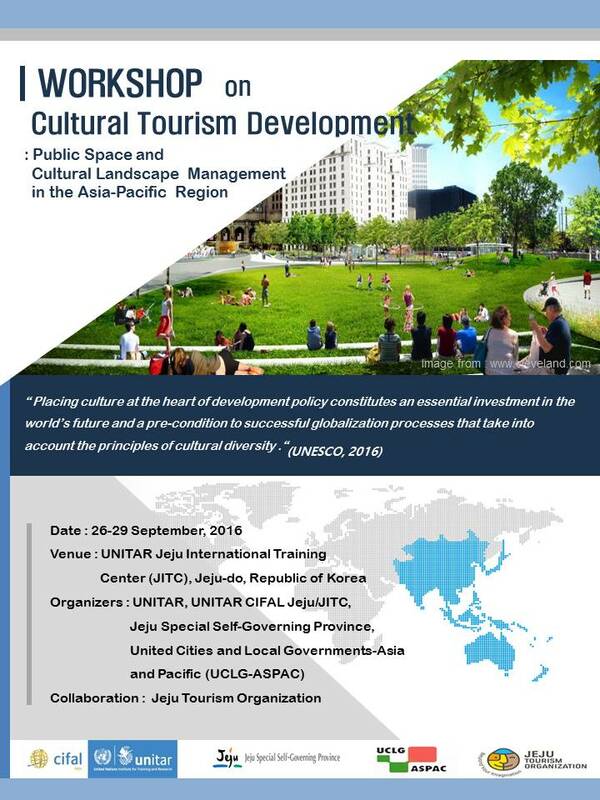 Understand cultural tourism trends and policy development in the context of 2030 Sustainable Development Agenda.
? Utilize the lessons learned from the cases of cultural tourism policy implementation in various regions for their action plans.
? Have a basic understanding of cultural tourism and deepen the ideas of sustainable practices for regional/city/local development through local people’s participation.
? Share best practices of the community/local government-driven tourism projects and understand its economic impacts on the regional development.
? Coordinate partnerships to effectively promote the benefits of cultural tourism policies with civil societies, government and local entrepreneurs. UNITAR and CIFAL Jeju will jointly issue a certificate upon completion of the workshop program.
? UNITAR CIFAL Jeju provides LIMITED financial assistance with the airfare to Jeju-do, Republic of Korea (see the agenda).
? Local expenses (transportation, accommodation and meals) during the workshop will be covered by UNITAR CIFAL Jeju.
? All other expenses are the responsibility of the participants. UCLG (2015), Culture 21: Agenda 21 for Culture, Committee on Culture UCLG, Barcelona.